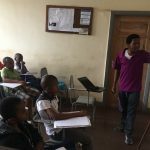 The Moshi Institute of Technology (MIT) is giving computer and English lessons to primary school students (age 7-13) and to secondary school students including employees and other communities (age 14-45). There are courses for beginners and advanced. Topics taught include English for communication, the use of a PC, hard- and software, internet and email (“Become an e-citizen!”), computer maintenance and repair. In the afternoon and evening there are courses for adults. Most of them are employees from the lower and middle income bands who seek to improve their communication and IT qualifications. Besides the topics mentioned above there are also courses offered in computer applications and office management. Our two centers in Moshi central and Himo are connected to Internet via broadband. They have around 40 computers which have been kindly donated. On this page, you can see which courses are offered at MIT Moshi and Himo. You can find more information, application forms, brochures and further contact details on a separate page. We offer different kind of short and extended ICT and business courses. Depending on demand and capabilities details can change so please get in contact with us for further information. You can find application forms and brochures here. Speaking and writing English is very important in today’s modern connected world. We offer professional English courses to improve your abilities in daily contact with clients and company partners. Accomplishing this course will push your future career opportunities. These courses are designed for those wishing to acquire full Secretarial and Office Information Technology skills and qualifications for entry into executive, secretarial and administrative positions. You will aquire competences in usage and knowledge of computers, text processing and special software. After finishing this course you will be prepared to develop initiative, responsibility and methods to deal with a range of situations which may occur during your future work in offices. Knowledge in accountancy is helpful in almost every situation in your life: Founding an own company, working in one or even for your own household. During the 3 months course we teach you fundamental theories accountancy the usage of popular applications. Afterwards you will be able to manage everything around taxes, subsidiary books, correct transaction entries, bank reconciliation and many other fields. Attractive designs are very important for almost every company to improve products, information material or advertisements. In our course you will learn the basic and advanced usage of popular graphic designing applications. After the course you will be able to handle the application’s workpace, the work with graphical documents, color selections, mask selections, layers, the work with typesets, advanced painting tools and retouching. The main aim of this course is to introduce the fundamental concepts necessary for designing, using, and implementing database systems and applications. Our presentation stresses the fundamentals of database modeling and design, the languages and facilities provided by database management systems, and system implementation techniques. During the Electronics course you will learn the language of electronics, elements and their functionality. We will analyze and characterize circuits, analog and digital signals, and work with digital systems. Words like counters, timers, diodes, resistors, waveform generators, logic gates and basic feedback theories may be unknow to you now, but after accomplishing this course you will be able to work even with advanced electronic systems. To build good-looking websites you will need knowledge about basic web concepts as well as advanced web technologies and programming languages. During this course you will learn about HTML, CSS and PHP, but also about SQL databases. We will also work with special software for website designing and use popular CMS frameworks.